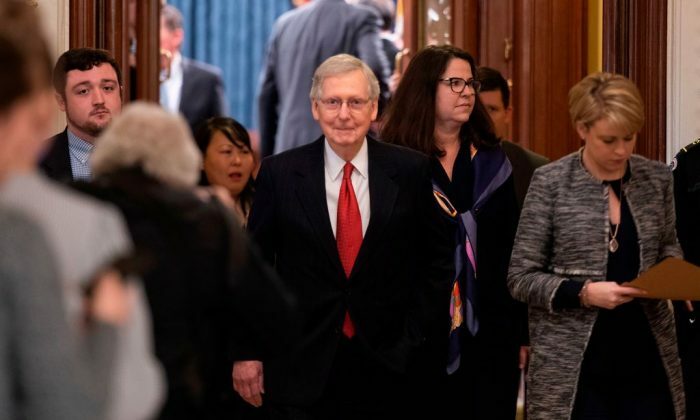 Six GOP senators broke from their party and voted with the Democrats on Jan. 24 for a spending bill that does not contain any additional funding for the U.S.-Mexico border wall. In the Senate, both a Republican-backed proposal and a Democrat-sponsored measure failed to reach the 60 votes needed. The measure backed by the Democrats failed to pass with a 52-44 vote. Six Republican senators crossed the aisle to vote for it: Mitt Romney (R-Utah), Lamar Alexander (R-Tenn.), Susan Collins (R-Maine), Cory Gardner (R-Colo.), Johnny Isakson (R-Ga.) and Lisa Murkowski (R-Alaska). Meanwhile, the Republican-backed measure also failed with a 50 to 47 vote and would have offered some protections for illegal immigrants. In that vote, two Republican senators, Tom Cotton of Arkansas and Mike Lee of Utah, broke with their parties along with one Democrat, Joe Manchin of West Virginia. The GOP proposal contains President Donald Trump’s $5.7 billion in funding for the border wall, while the Democrat’s measure did not. Both bills aimed to put an end to the historically long partial government shutdown, now in its 36th day. Despite those outliers, Trump appeared to be pleased with the level of unity within his party. Trump also had high praise for Manchin, the lone Democrat who crossed the aisle to vote for the GOP’s measure. Trump has made several attempts at striking a bargain. On Jan. 19, he outlined an offer which would provide temporary protection from deportation to some 700,000 illegal immigrants that came to the country as children in exchange for border wall funding. Trump’s proposal, outlined in a televised address on Jan. 19, was rejected by Pelosi before he started to speak. Meanwhile, a group of centrist House Democrats is calling on House Speaker Nancy Pelosi (D-Calif.) to end the stalemate over funding for the U.S.-Mexico border wall and to offer a compromise.